The Abtech safety SLIX 100 kit is a stretcher combined with horizontal and vertical lifting straps and a dedicated carry bag. This unit is robust, compact and lightweight considering it is a safety stretcher, designed for carrying injured persons in difficult and dangerous outdoor environments. The SLIX 100 stretcher Kit is intelligently designed and manufactured from highly flexible materials as well as a smooth finish allowing for safe and easy sliding and the unit to be rolled either lengthways or widthways when being hauled over difficult terrain. Damage to the structure is effectively prevented by the webbing being situated around and not below the stretcher. 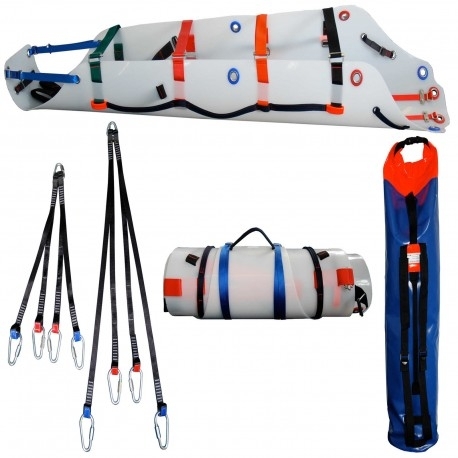 The Abtech safety SLIX 100 stretcher kit comes with well constructed and robust handles situated around the stretcher permitting it to be carried or manoeuvred by a number of rescue personnel. This intelligent and ergonomic design allows the stretcher to be positioned and hauled either horizontally or vertically. The Abtech stretcher unit can be used with the Abtech two-person tripod in cases of confined space rescue. These units are manufactured in full conformance with CE93/42/EEC class one standards. The maximum manufacturer’s recommended user weight is 400 kg. The dimensions are 915 mm width and 2300 mm length.